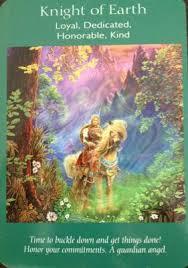 Here is your Angel Card Reading & Channeled Message for the week of 12/11. As always, I asked the angels to please give me a clean and clear reading for you, my clients, students and followers. For today’s reading they took me right to the Angel Tarot Cards, how unexpected! One card pull. This is so in line with everything I’ve been reading about the planetary influences right now, and with the major energy shift for the collective (all of us) that I’ve been feeling for the last little while. This card supports the feeling and that we’ve become unstuck, and we can now move forward with projects and creations we’ve been either pondering, or unsuccessfully attempting to bring into being. This card tells us It’s Time. This card is also telling us that Mother Earth and the guardian angels are right here with us now, cheering us on and helping us move ahead. It also signifies that you may now (or soon) see the arrival of a good, helpful, diligent, honorable, and dependable person coming into your life now, to help you get it done. I do get the sense this is not romantic, but more practical in nature. Now I will say that there is a bit of trickiness here, as this is a card of the fairies, and they can be a bit impish. It’s also a card of the material world, which can contain temptation to derail us. So I would advise proceeding with eyes wide open, one step at a time, thinking and more importantly feeling your way along and asking yourself – which of these choices feels most in alignment? Which was holds more Light for me? And do call on your guardian angel now for assistance, dear one! He or she is right there, right now, just waiting for you to chat with them and to ask for their help and guidance. You are so loved, and with this we are complete. Happy unstuckedness, lovely ones! Feels good, doesn’t it? p.s. – still looking for that perfect Christmas gift? How about an angel card reading by email or phone?